Teachers and staff from P.S. 220 in Queens wore T-shirts in support of the NYPD on the first day of classes to protest the teachers union's backing of the Staten Island march held in honor of Eric Garner, who died in police custody. SUNNYSIDE — Parents and teachers in some Staten Island schools feel "ostracized" and "intimidated" by pro-NYPD shirts worn by colleagues in a classroom protest of their union's support of the Eric Garner rally, the NAACP said. A representative of the local NAACP chapter said it's received many complaints since hundreds of teachers decided to wear T-shirts with slogans like "New York's Brightest Supports New York's Finest #ThankYouNYPD" on the first week of school. "Many parents of color have reached out to me about the silent protest, some of the people that I know across the city that were working for the [Department of Education] have been offended," said Tammy Greer Brown, of the Staten Island NAACP, who brought up the group's concerns at a Community Education Council meeting Monday night. "People of color have been afraid to say anything about this for fear of retaliation and others have been ostracized for their stand on supporting the march." Many teachers had planned to wear the shirts on the first week of school to protest United Federation of Teachers President Michael Mulgrew's support for a rally protesting the July death of Garner, who died after being put in an apparent chokehold while being arrested for allegedly selling untaxed cigarettes. An email apparently circulated last week by the United Federation of Teachers warned that the Department of Education saw the protest as a "threat" to teacher objectivity. "The DOE has reason to believe that there may be protests in the form of tee shirts that will be worn to school tomorrow," the note begins, according to a version shared on Facebook. "They asked us to remind you that as public employees, one must remain objective at all times. "Certain tee shirt messages may appear to be supportive, but individuals (parents, students) may see a different meaning in that message. Principals may report any inappropriate apparel to the chancellor." While the warning prompted some teachers to back out of the protest, others around the city wore them anyway and posted pictures of themselves on Facebook groups. However, after the mayor and chancellor made public comments that gave the OK for teachers to sport their pro-NYPD shirts in the classroom, many decided to move the protest to this week, Greer Brown said. She said she heard of at least three schools across Staten Island where teachers donned the shirts on Monday, and pro-NYPD Facebook groups have been flooded with people taking selfies featuring the shirts. "Your personal opinion does not belong in the classroom," Greer Brown said during the meeting. "It is in no difference to somebody walking into school with a T-shirt that says 'Hitler was a genius' to somebody who was Jewish and who takes the Holocaust very seriously." At the meeting Debra Penny, UFT borough representative for Staten Island, said that the union sent out the note to try and avoid potential discord in classrooms. "We did what we could and we certainly will go to schools and talk [about Garner]," she said. 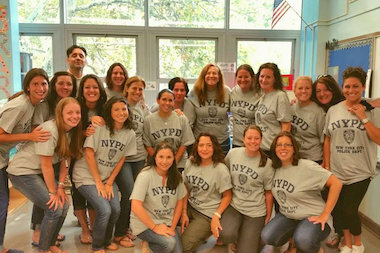 Donna Romani, a paraprofessional at a Staten Island school, previously told DNAinfo New York that the decision to wear the T-shirts was to show support for the NYPD. "We're just wearing the shirts to show our support for the NYPD," she said. "We were against the unions marching without asking the members."